Moist. Woods, thickets. Partial sun to medium shade. 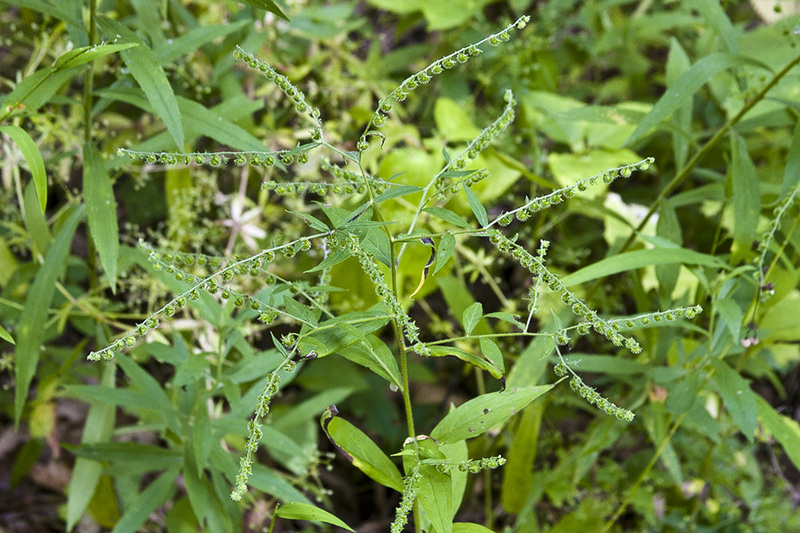 This is a 15″ to 47″ tall, erect, lanky, biennial forb that rises usually on a solitary stem from a short taproot. In its first year it appears as a rosette of basal leaves. In the second year is sends up a flowering stem. 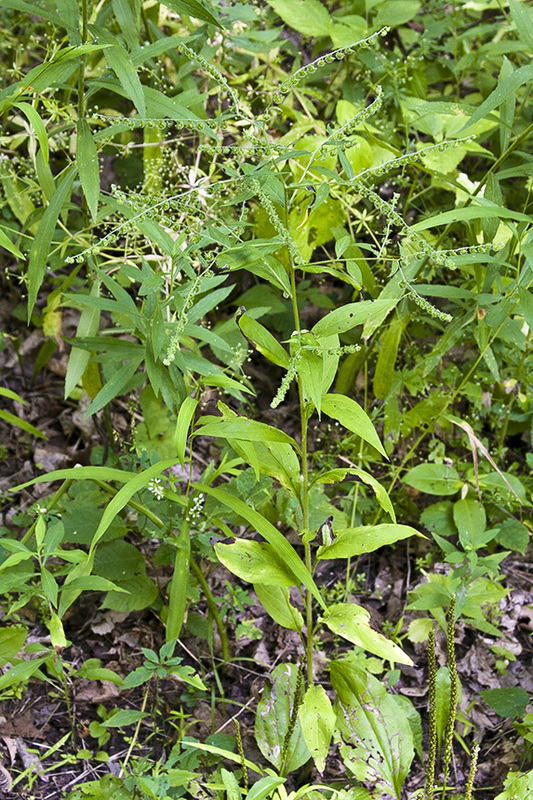 The stems are erect, slender, and rough to the touch. They are moderately covered with short, fine hairs. The hairs above the midpoint are spreading or point upward, those below the midpoint point downward. They have a few to many branches above the middle. The branches are perpendicular to the stem. The lowest stem leaves are alternate, elliptic to egg-shaped, 2″ to 12″ long, and ¾″ to 4″ wide. 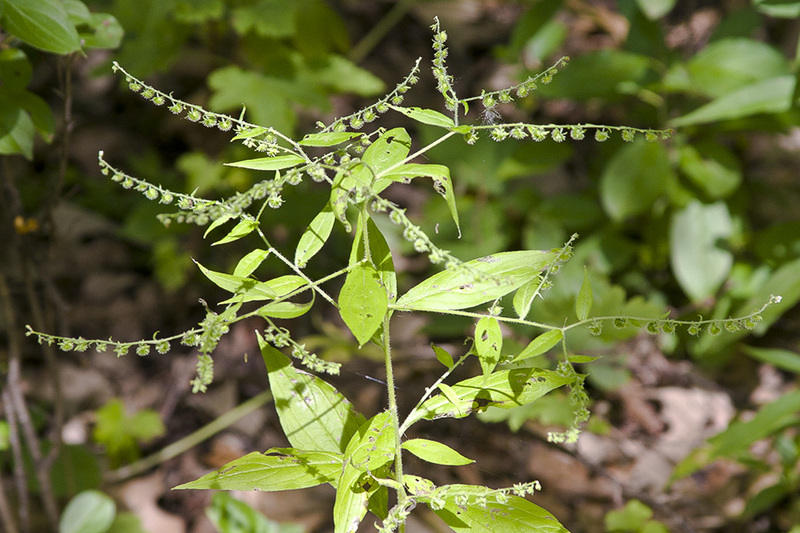 They are on narrowly winged, up to 2″ long leaf stalks. They are abruptly narrowed at the base and taper to a sharp point at the tip with straight sides along the tip. There is a single prominent midvein and 3 to 7 noticeable pairs of lateral veins. The upper surface is rough to the touch and moderately covered with minute, stiff hairs. The lower surface is moderately covered with minute, fine hairs and, especially along the veins, longer hairs. The margins are untoothed. Lower stem leaves just above the lowest ones are similar but half as long. Stem leaves become progressively smaller, narrower, and shorter stalked as they ascend the stem. 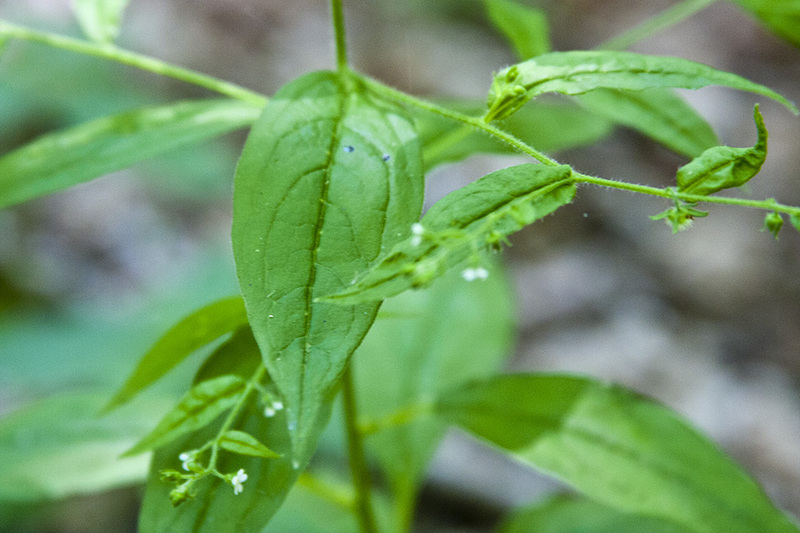 Upper stem leaves are narrowly lance-shaped and stalkless. 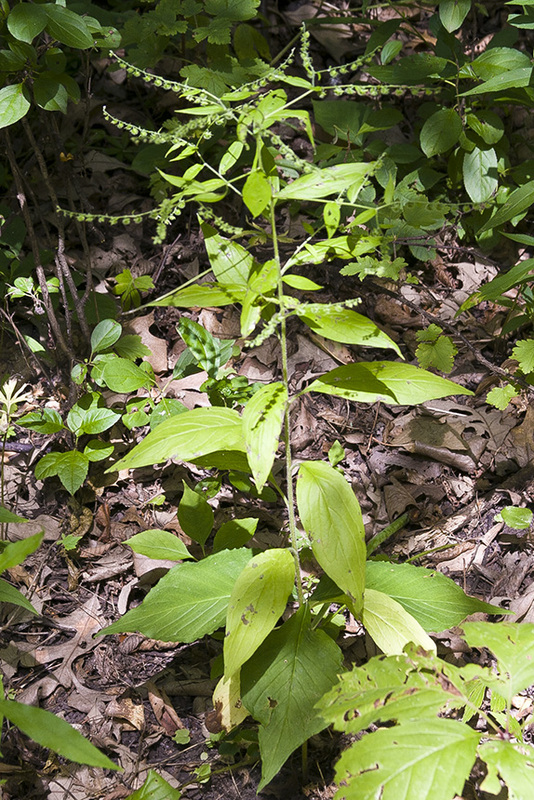 Basal leaves are similar to lower stem leaves but are smaller. They are usually withered or absent by flowering time. The inflorescence is an unbranched array (raceme) of many small flowers. The racemes usually occur in pairs at the ends of the branches, sometimes on short branches from leaf axils. They are short and closely spaced when they first appear, 2″ to 6″ long, widely spaced, and usually coiled like a scorpion’s tail when mature. The axis of the raceme is covered with spreading to ascending hairs. 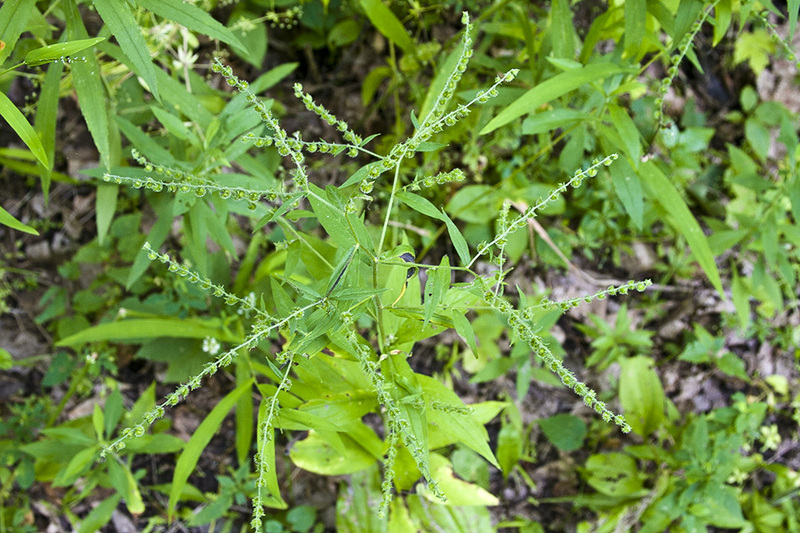 The flowers are on 1 ⁄32″ to ⅛″ long stalks (peduncles). 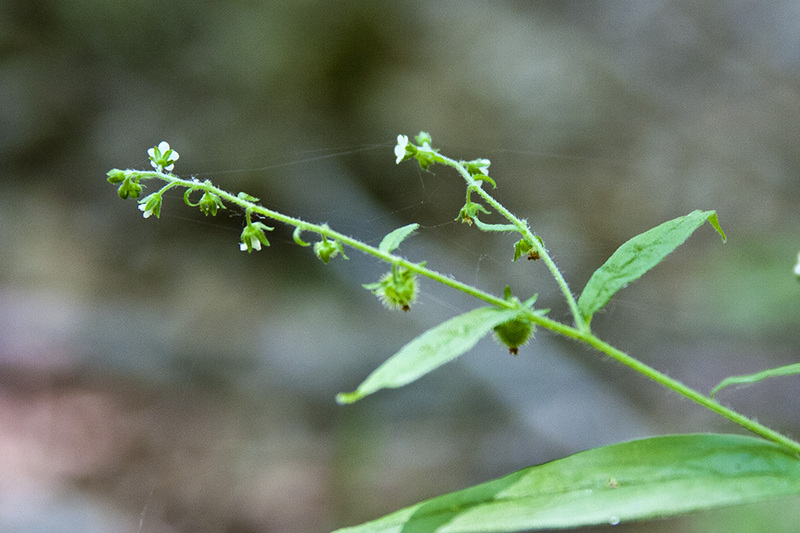 The flowers near the base of the raceme are subtended by lance-shaped to linear lance-shaped, leaf-like appendages (bracts). 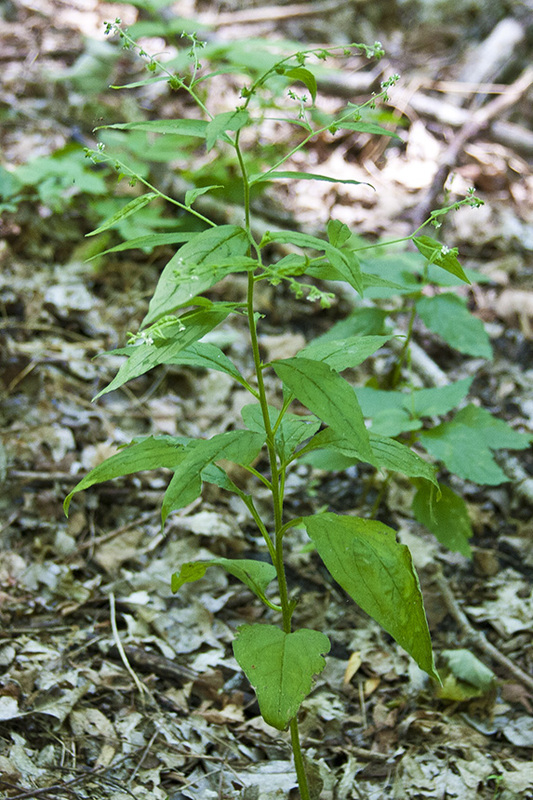 The bracts become progressively smaller as they ascend the stem, and disappear midway through the raceme. Each flower is 1 ⁄16″to ⅛″ in diameter. There are 5 sepals, 5 petals, 5 stamens, and 1 style. The sepals are green and covered with bristly hairs. They are fused at the base into a very short calyx tube, then separated into 5 lance-shaped, 1 ⁄32″to 1 ⁄16″ long lobes. The lobes are much longer than the tube. The petals are white (rarely pale blue). They are fused at the base into a 1 ⁄32″to 1 ⁄16″ long corolla tube, then separated into 5 rounded, 1 ⁄32″long lobes. In the throat of the trumpet shaped corolla there are 5 white scale-like appendages. The stamens have very short filaments and do not extend beyond the corolla tube. The style does not extend beyond the corolla tube. The fruit is a tight cluster of 4 nutlets. Together, the cluster of nutlets is globe-shaped, 1 ⁄16″ to ⅛″ long. The individual nutlet has a fringe of long, barbed bristles on the margins but no bristles, rarely 1 to 3 short bristles, on the upper (dorsal) surface. It is green at first, turning brown when ripe. At fruiting time the peduncles become slightly longer and droop downward; and the calyx persists, the lobes elongating to 1 ⁄16″ to ⅛″ long. 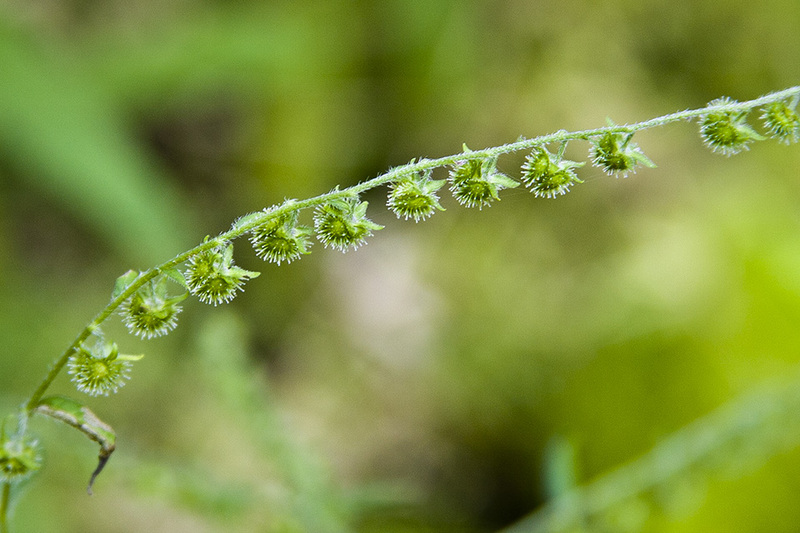 The seeds spread by clinging to the fur of passing animals and the legs and socks of passing hikers. Virginia stickseed (Hackelia virginiana) individual nutlet has bristles around the margins and 10 to 25 bristles on the dorsal surface.